Secrets to the best fried chicken. Learn my 3 secrets and get the recipe for the best buttermilk fried chicken. Bacon aside, there are few things I love more than fried chicken. What can possibly be more soul satisfying than a moist flavourful piece of chicken encased in a thick, crunchy crust? Not much, I say. Yet despite my affinity for fried chicken, the crispy skinned allure of Colonel Sander’s Original Recipe overruns my better judgement a few times a year. Every time I step foot into a KFC to sate my hankering, I feel a twinge of hypocrisy, and yet I’m at the mercy of the fast food fryer. Well today, I said enough is enough, and I set out to come up with the best buttermilk fried chicken recipe. A fried chicken that the Colonel himself would swoon over, with a thick, crunchy, aromatic crust, and a tender juicy interior that’s infused with flavour, right down to the bone. I know, this is a bold statement. Some may even call them “fightin’ words”, but I wouldn’t say it if I didn’t think I could back it up. If you’ve been following along for any length of time, you know I have a history of making audacious claims when it comes to poultry. To make my ultimate fried chicken, I’ve employed a few tricks that I’ve learned over the years. The first is to brine the chicken. This is a must for any roast chicken, and it works equally well in fried applications. The fundamentals of brining are simple, you’re soaking the chicken in a salt and sugar solution that flavours the meat, much like a marinade would, while increasing the chicken’s moisture content. For my fried chicken, I decided to user buttermilk instead of water, and I stuffed it full of aromatics such as onion juice, garlic, celery seed and rosemary. After a night soaking in the buttermilk brine, the chicken is literally bursting with flavour, from the inside out. Satisfied that I’d given the chicken the love and flavour that it needed, I moved onto the skin. In fried chicken circles, there’s much debate over how to get a nice crunchy crust. I’ve found the double dredge gets a nice thick crinkled crust that stays crunchy long after the chicken has turned cold (not that there would ever be chicken left on the plate long enough to go cold). Since the brine is quite salty, I avoided adding any salt to the flour, but that didn’t stop me from cramming in more flavour with spices like onion powder, paprika and more celery seed. The last secret to making the best fried chicken is to let the coated chicken air dry for about an hour before frying it. This does two things. The first is that it gets the chicken up to room temperature, which helps it cook evenly once it’s in the oil. The second benefit is that some of the surface moisture evaporates, making the chicken crisp up nicely as it’s fried. I won’t lie to you, this is a rather involved recipe that takes some time, but it’s not impossible to make on a work night if you put the chicken in the brine the night before. I like serving this with fluffy biscuits and plenty of honey to drizzle on both the biscuits and chicken. Put the celery seed, rosemary, peppercorns, and bay leaf in a spice grinder and grind. Add the spices, onion and garlic into a gallon sized freezer bag with the buttermilk, salt and sugar. Seal the bag and shake to combine. 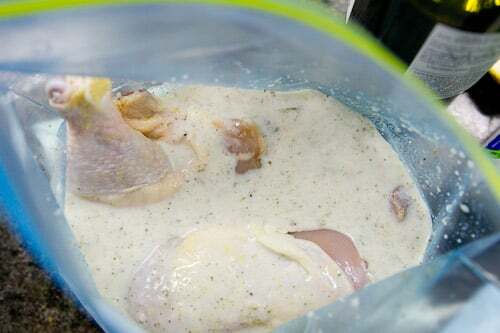 Add the chicken legs and seal the bag, pushing out as much air as possible, so the chicken is submerged in the buttermilk. Refrigerate overnight. In a gallon sized freezer bag, combine the flour, onion powder, paprika, celery seed and black pepper and shake to combine. Remove the chicken from the buttermilk brine and use paper towels to dry off the chicken and remove any extra bits of spices. 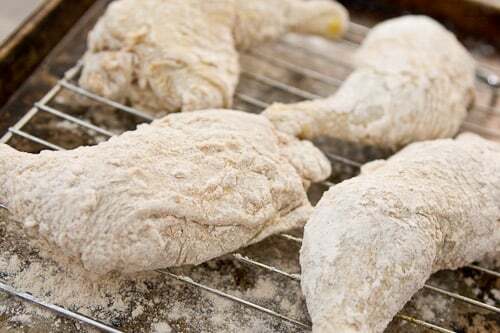 Add the dried chicken into the freezer bag with the flour one at a time and toss to coat. Shake any excess flour off as you transfer the chicken to a wire rack. Strain the buttermilk brine through a sieve to remove the spices. Dip the chicken in the buttermilk mixture then put each piece back in the bag with the flour and apply a second thicker coating of flour. Place the chicken on the rack and let it air dry for at least 1 hour. In a large heavy bottomed pot, add the oil. The oil should be at least 2" deep. Heat over medium high heat until it reaches 340 degrees F. Carefully add the chicken to the hot oil. The temperature will fall a bit, and you want to keep the oil right around 320 degrees F for the duration of they frying, so adjust the heat source as needed. The chicken will take about 12-15 minutes to cook through and should be golden brown on the outside. You can use a meat thermometer to check and see if the chicken is cooked on the inside, but take the chicken out of the oil once before checking, or the juices coming out of the chicken will make the oil splatter. As the chicken is done, remove them from the oil and drain on a paper towel lined wire rack. Let the fried chicken rest for a few minutes and serve. This recipe looks finger lickin’ good! This recipe may be a bit more involved, but I am sure the exceptional results are well worth it! Wow really the best buttermilk fried chicken i’ve ever seen!!! This recipe looks finger lickin' good! This recipe may be a bit more involved, but I am sure the exceptional results are well worth it! This looks awesome. I’ve always been afraid of making fried chicken at home (besides wings) but you’ve got me drooling. Wow really the best buttermilk fried chicken i've ever seen!!! This does look pretty incredible. I’m with Maggie, though. I’ve always been — and still am — afraid of frying at home. That hot oil is very intimidating for someone as clumsy as me. The addition of rosemary seems like a great touch to the recipe, by the way. Thanks:-) I usually do my deep frying in a deep stock pot. This helpscontain all the splattering so unless you’re directly above the potit’s harder to get hit with the oil. We used to have househelp who made fried chicken like I’d never tasted before. She definitely went for the brining method but guess what she used? Instead of salt + sugar marinade, she had a secret ingredient – Coca Cola! I love fried chicken but seldom make it; when I do it’s with a similar Buttermilk method but have not brined it or added the variety of spices you do. I now have but one purpose for that fryer I bought last year and have yet to use…to try this! I’ve only recently learned how to make good roasted chicken, but I still have never tried frying it at home! For me, the fear is not so much about the splatter, but about the greasy smell that will be stuck in my house for hours and possibly days. My tiny urban kitchen has no real fume hood, and therefore whenever I grill/fry etc. the whole apartment smells like oil! This looks awesome. I've always been afraid of making fried chicken at home (besides wings) but you've got me drooling. Oh, my! I know what I might be cooking this weekend! 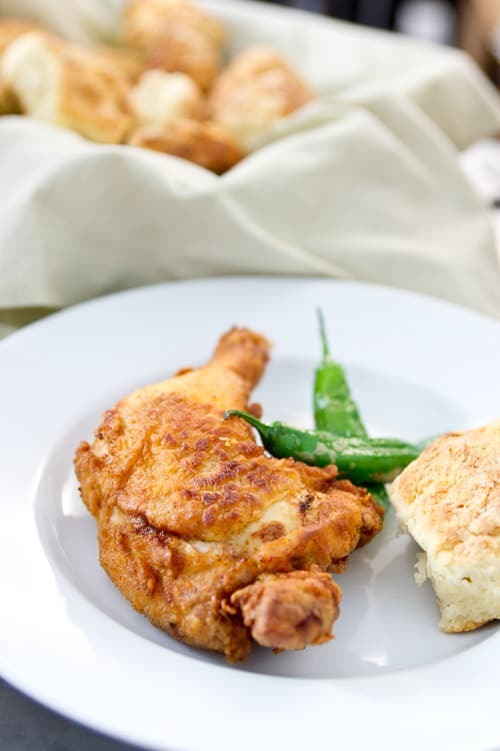 There is nothing better than fried chicken made at home with a really crispy crust! I do not make it often, but it is sooo good when I do! I will definitely use your recipe. I love all the extra seasonings and the buttermilk brine! This does look pretty incredible. I'm with Maggie, though. I've always been — and still am — afraid of frying at home. That hot oil is very intimidating for someone as clumsy as me. The addition of rosemary seems like a great touch to the recipe, by the way. Thanks:-) I usually do my deep frying in a deep stock pot. This helpscontain all the splattering so unless you're directly above the potit's harder to get hit with the oil. We used to have househelp who made fried chicken like I'd never tasted before. She definitely went for the brining method but guess what she used? Instead of salt + sugar marinade, she had a secret ingredient – Coca Cola! A must make………………………….seriously looks good! I love fried chicken but seldom make it; when I do it's with a similar Buttermilk method but have not brined it or added the variety of spices you do. I now have but one purpose for that fryer I bought last year and have yet to use…to try this! I've only recently learned how to make good roasted chicken, but I still have never tried frying it at home! For me, the fear is not so much about the splatter, but about the greasy smell that will be stuck in my house for hours and possibly days. My tiny urban kitchen has no real fume hood, and therefore whenever I grill/fry etc. the whole apartment smells like oil! This sounds fantastic! Great tips – I’ve never made fried chicken before, and I never would have thought of letting it sit out. Can’t wait to try it! This sounds fantastic! Great tips – I've never made fried chicken before, and I never would have thought of letting it sit out. Can't wait to try it! What a fantastic recipe. I’ve heard of all the tips before except for the one-hour rest after coating the chicken. Cool! Thanks for sharing these tips and AMAZING photos. What a fantastic recipe. I've heard of all the tips before except for the one-hour rest after coating the chicken. Cool! Thanks for sharing these tips and AMAZING photos. I literally wanted to lick the screen Marc! This looks amazing and absolutely, lip smackin’ delicious! I’m not a fan of deep frying (mostly due to technique) but I’m willing to give this a go! Thank you for sharing! I literally wanted to lick the screen Marc! This looks amazing and absolutely, lip smackin' delicious! I'm not a fan of deep frying (mostly due to technique) but I'm willing to give this a go! Thank you for sharing! Sounds a great recipe and away from the usual, I’m going to try with chicken supremes and because I don’t go in a lot for deep frying I’ll roast in very hot oven sprinkled with oil after a few minutes. Hope it works!! Sounds a great recipe and away from the usual, I'm going to try with chicken supremes and because I don't go in a lot for deep frying I'll roast in very hot oven sprinkled with oil after a few minutes. Hope it works!! A great recipe is hard to come by, especially for fried chicken. I recently bought a Taiwanese fried chicken cookbook because their night market is a gem for such. What does buttermilk do in this case? I am always wondering because it’s in almost all recipes I have seen. The buttermilk plays a couple of rolls. First it’s the liquid in thebrine which adds moisture to the meat, keeping it from drying out.Secondly it adds a nice flavour to the chicken. The last thing, whichI’m not entirely sure about, is that it may act as a meat tenderizer. A great recipe is hard to come by, especially for fried chicken. I recently bought a Taiwanese fried chicken cookbook because their night market is a gem for such. What does buttermilk do in this case? I am always wondering because it's in almost all recipes I have seen. The buttermilk plays a couple of rolls. First it's the liquid in thebrine which adds moisture to the meat, keeping it from drying out.Secondly it adds a nice flavour to the chicken. The last thing, whichI'm not entirely sure about, is that it may act as a meat tenderizer. Made your chicken last night, and you are right, this is the best buttermilk fried chicken ever!! your methodology is genius..especially letting it rest for an hour! I just finished making it, and it was even better than I could have imagined. Also, I prefer double coating in rice flour to really give it that crispy crunch! Thank you! Buttermilk does indeed act as a tenderizer. I use it when I am making sauerbraten. Also adds a lot of flavor. Sounds great! I will try some of the tips tonight. 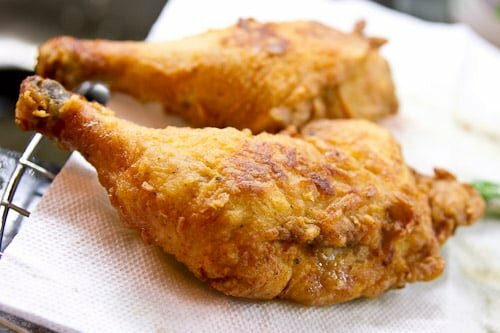 Some of my mother’s tricks whose fried chicken was highly regarded in four counties and especially at home, she always removed the skin, did a flour dredge, egg buttermilk, dip, and another flour coating. Frying in shortening in a stainless steel pan with a tight fitting lid , almost steamed a little as fried. Your seasoning sounds flavorful. Mother would only use salt, pepper, garlic powder and it was still tasty. my mother made a seasoning mix that included good seasons italian dressing-dry- & dry tomato soup. she always poured bmilk or evaporated milk the nite b4-wish ihad paid more attn! Shishito Peppers and are not very spicy. OMG!!! Just made this and I have to agree that this is the best fried chicken recipe I have ever used(and I have used tons). Thank you for posting this is. It was also my first attempt at frying chicken and it all worked out. No salmonella or anything. I am making this right now, ack! can’t wait! I just made this and it is the best fried chicken ever. So tasty, so crispy. Unreal! could I make this with skinless chicken breasts?